The rise of the internet has opened up several new avenues for entrepreneurs to realize their business aspirations. E-commerce is one of the several businesses that have gained momentum with the increasing penetration of the internet. Fueled by a 55% growth in mobile sales in a year, e-commerce in North America grew by 16% in 2018 to over $500 billion. However, e-commerce is a competitive sector. To stay ahead of competitors, you need to ensure that your e-commerce store is equipped to meet your business demands, apart from offering security and ease-of-use. Finding such a platform can be tedious, but this post will make things easier for you by highlighting some of the top e-commerce platforms available today. Shopify is one of the most popular e-commerce platforms out there. It offers several third-party apps and professional-looking themes. But most importantly, it claims that you don’t need technical or design experience to set up the e-store. You can easily integrate your store with fulfillment centers and drop shipping companies. You can also quickly add listings from Amazon and eBay, and Facebook Store solutions to your store. It offers unlimited hosting, best analytics, SEO optimization, discount and coupon engine, gift cards, and email marketing tools. The platform accepts several different credit cards and other payment gateway integrations. It comes with Level 1 PCI-compliance and 256-bit SSL encryption, providing better security. You can monitor your store on-the-go with their mobile app and get 24/7 customer support by phone, instant messaging or email. Overall, it’s an excellent platform for entry-level e-commerce stores. Sites: KKW Beauty, Harper Wilde, and Caravan. If you want a seasoned online store that can easily integrate with Instagram, Facebook, eBay, Amazon, and others without further coding, BigCommerce is your best choice. It offers better value for money compared to Shopify. Still, for advanced features like abandoned cart recovery, you’ll need to upgrade to an advanced package. It offers more than 40 pre-integrated payment gateways. You can customize the shipping details as required, and also get detailed and flexible product management options. Along with various integrated marketing tools and analytics, you get access to Google Trusted Store certification assistance. BigCommerce is available as a pure SaaS solution or as a part of your favorite CMS. However, it offers only seven free themes, which is a big letdown. Squarespace is a visual website builder that allows you to build websites with a simple drag-and-drop interface. When it comes to templates and themes, you can choose from several professional designs with excellent typography, color schemes, and responsiveness. You can tweak the design further by adding your own CSS. You can see a live preview or video walkthroughs to get acquainted with the designing process. It offers a wide range of features such as Blocks for creating web forms, logo designing tools, and analytics for tracking site traffic and online sales data. Squarespace provides hosting facility and includes its cost in its monthly price. However, 24/7 customer support is available via online chat and email only. It also lacks advanced marketing and analytics, and offers limited integrations for payment gateways. Sites: Honey and Bloom, Supernatural Kitchen, and Egg Shop. WooCommerce is an open-source and customizable WordPress plugin designed for small and medium e-stores. It offers a vast selection of plugins and extensions, SEO and other analytics tools, and free as well as paid themes. It comes with a built-in shopping cart and secure payment gateway, but requires an additional plugin to set up a multivendor store. It offers higher flexibility, but advanced features need more investment. There is no central customer support as each element has its own assistance. Customization requires knowledge of WP development and can also be time-consuming. It also lacks scalability. Another open-source e-commerce platform, Magento is well-known for its reliability and scalability. The user-friendly platform comes with features like the ability to manage multiple storefronts, multi-language and multi-currency support, mobile-friendly design, and extensive customization to create the functionality you need. It is a self-hosted platform. The vast Magento community can help troubleshoot development issues. However, being a remarkably large system, Magento development requires extensive coding knowledge and experience. SMEs may find it cost-prohibitive. Shared hosting is not an option as its large file and database size requires dedicated servers. It is the right choice for a quick scale up to an enterprise-grade online store. Volusion is a feature-rich e-commerce platform. It offers several customizable templates. It comes with various product management tools, analytics for SEO and social media marketing, payment and tax management tools, order-management functionality, and easy POS, Amazon, and eBay integrations, among other features. Volusion also offers a built-in Deal of the Day feature that allows you to promote a specific product easily, as well as a customer loyalty program called MyRewards. There is no shortage of tutorials on running your online store. However, it lacks an integrated blogging system. It is also not as intuitive as Shopify. 3dcart is a fully-customizable, easy-to-use, and one of the longest-running e-commerce platforms out there (established in 1997). It offers features such as a gift-wrapping module, purchase order system, over 100 payment gateways, an extensive knowledge base, assistance for SEO, PPC, and social media marketing, ability to offer recurring orders, tons of shipping options, and direct blogging from the platform. It also provides 24/7 support via phone, email, and online chat. However, you may have to pay extra for advanced features which can quickly add up the costs. Also, there are no hidden fees, but the pricing is a little outdated. Like Squarespace, Wix is also an all-inclusive website builder. It takes care of security and architecture while allowing you to customize the look of your online store. It offers a diverse range of free and paid templates, add-ons, and e-commerce tools. The new Artificial Design Intelligence (ADI) feature uses an algorithm to make drag-and-drop designing even faster. Their tech support is quick and elaborative. Wix offers a free plan if you use their sub domain. However, the site loading speed is slow enough to affect your SEO. Big Cartel is the right e-commerce platform to start a small online store that also requires creativity. It is easy-to-use, affordable, and also comes with a free plan. It allows you to use three sales channels including your store, Facebook, and brick-and-mortar. You can accept credit cards for in-store sales via Square or Stripe. However, it is not scalable, offers limited SKUs (under 300 products), fewer payment gateways as well as marketing and analytics tools. It is suitable for painters, photographers, small artists, bakers, and authors. Customer support is available via live chat and email only. 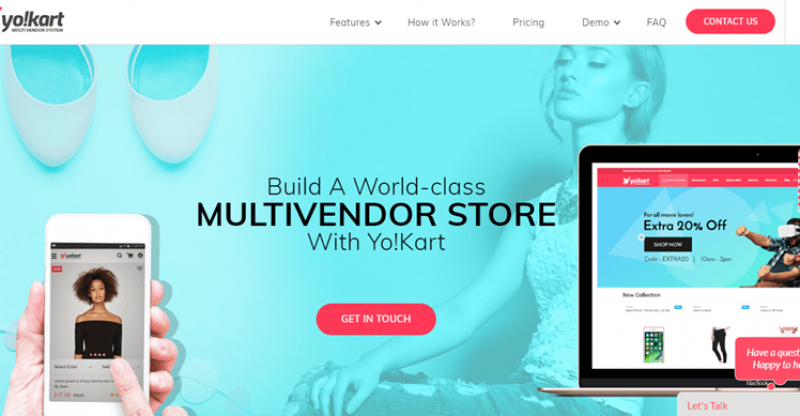 Specializing in multi-vendor e-commerce online stores, Yo!Kart offers turnkey solutions. Their system is mobile-ready, search-friendly, intuitive, customizable, and scalable, making it suitable for growing startups and small businesses. It comes with a multi-currency payment system, email marketing system, rewards and discount coupon management tools, quick social media integration, quality interface, multiple SEO optimization tools, and the ability to analyze user experience. There are no additional or hidden costs. It offers limited website layout customization options. You need a developer with extensive PHP knowledge for customization. You can’t upgrade to the latest version without paying the full price of the new version, which is costly. As you can see, each e-commerce platform comes with its own set of pros and cons. There is no single silver bullet to kill all your e-commerce requirements. So, you will need to carefully choose a platform that offers the best possible solution for your e-commerce goals without going over the budget. Good luck!